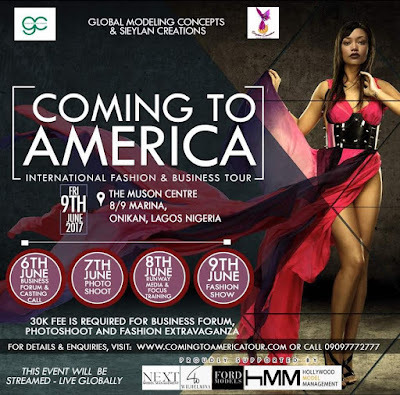 Fresh off their inaugural, Global Modeling Concepts and Sieylan Creations in the United States America are looking for fresh faces and striking beauty across Nigeria for the second African edition of the fashion-based platform - “Coming to America” International Fashion and Business Tour. The 4 days extravaganza will scout Nigeria's top models and talents discovered in 2016 and 2017. The invitation-only evening will not only present an opportunity for celebrated and distinguished agencies to procure new talent, but will also feature a runway show featuring fashion designers, makeup artiste from Nigeria. 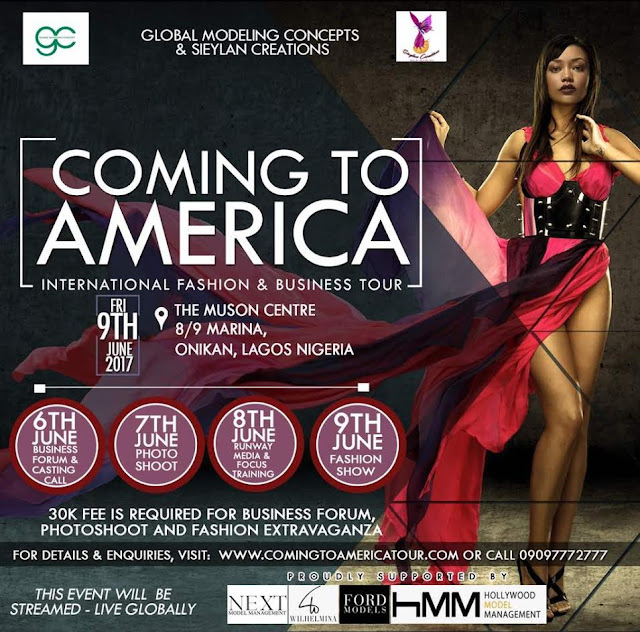 "Coming to America International Fashion & Business Tour"
The “Coming to America” International Fashion and Business Tour will take place onFriday, June 9TH, 2017 at THE MUSON CENTER ONIKAN, LAGOS Nigeria. Runway show featuring international and domestic designers soiree immediately following the runway show. If you are a talent or modeling agency seeking international talent, we invite you to attend this exclusive event. Global Modeling Concepts & Sieylan Creations will pay for all models work visas.